Northeast Alabama Community College presents Music on the Mountain featuring Shenandoah on their 30th Anniversary Tour. Performance will be at the Tom Bevill Center on Saturday, August 18, 2017 at 6pm. Shenandoah is well known for hits like “Next to You, Next to me”, “Two Dozen Roses”, “Church on Cumberland Road”, “Mama Knows”, as well as beautiful classics in “I Want to be Loved Like That” and the Grammy winning “Somewhere in the Vicinity of the Heart” duet with fellow country musician, Alison Krauss. Because of Marty Raybon’s vocals, which are like no other, and the skilled musicianship of the band, Shenandoah became the forefront of country music radio stations and country lovers’ discussions. Today that legacy continues as original members Raybon and Mike McGuire reunite to launch a new chapter in Shenandoah’s storied career. It all began when the guys got back together to perform a benefit concert for a friend battling cancer. There was such a response to their reunion that they decided to make another run at it. The band has done so many shows together that even 17 years apart didn’t affect their chemistry on stage. establishing a national fan base with their self-titled debut in 1987. However, it was the band’s sophomore effort, The Road Not Taken, that spawned their first top ten hits—“She Doesn’t Cry Anymore” and “Mama Knows.” Shenandoah followed with three consecutive No. 1 hits— “Church on Cumberland Road,” “Sunday in the South” and “Two Dozen Roses.” “The Church on Cumberland Road” spent two weeks at the top of the chart and made country music history as it marked the first time that a country band’s first No. 1 single spent more than one week at the summit. It also helped propel sales of the album to more than half a million units thus giving Shenandoah their first gold album. Although this is a group of writers, they really prided themselves on having great ears for great songs, which have provided the foundation for Shenandoah’s illustrious career. Shenandoah was known for songs that celebrated the importance of faith and family while reveling in the joys of small town life. “Next to You, Next to Me” topped the charts for three weeks and “Somewhere in the Vicinity of the Heart,” a beautiful duet with Alison Krauss, won a Country Music Association Award for Vocal Event of the year and a Grammy for Best Country Performance by a Duo or Group with Vocal. Shenandoah also won the Academy of Country Music’s Vocal Group of the Year in 1991. Shenandoah recorded nine studio albums and placed 26 singles on Billboard’s Hot Country Songs chart. The boys from Muscle Shoals have left a potent legacy at country radio with such enduring hits as “Ghost in This House,” “I Want to Be Loved Like That”, “Rock My Baby,” “Janie Baker’s Love Slave,” “If Bubba Can Dance (I Can Too)”, written by Raybon and McGuire and “Her Leavin’s Been a Long Time Comin,” in which former Dallas Cowboy quarterback Troy Aikman was in the video (also written by McGuire). Today, the band is amazed that Shenandoah is in the top five recurrents on all the XM radio shows. That has only fueled the fire to push forward in creating and recording new music, some of which they will even produce themselves. 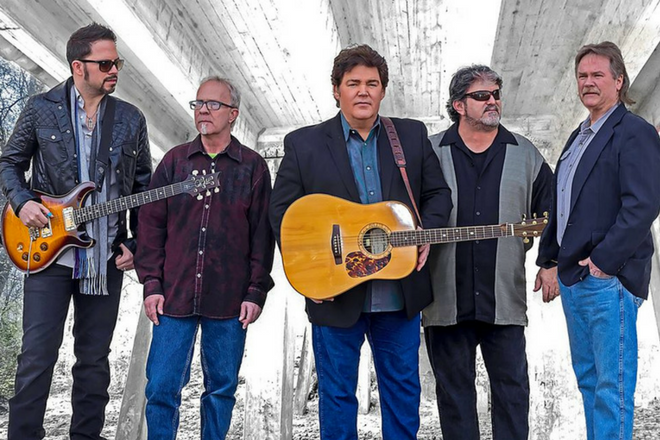 Even though Shenandoah is recording new music and touring for their 30th Anniversary, Raybon will still perform select solo dates. In the years since he exited Shenandoah, he’s established himself as an award-winning bluegrass artist. Though much has happened since Raybon and Shenandoah parted ways, the bond has never been broken. It was the music that brought them together and the music that continues to bind them. Reuniting didn’t seem to be in the cards before, but now appears to be the time. Get more details about the event here. Purchase tickets here.